This set of Network Theory Multiple Choice Questions & Answers (MCQs) focuses on “Series Resonance”. 1. The circuit is said to be in resonance if the current is ____ with the applied voltage. Explanation: The circuit is said to be in resonance if the current is in phase with the applied voltage and not if the current is out of phase with the applied voltage. The study of resonance is very useful particularly in the area of communications. 2. In a series resonance circuit, series resonance occurs when? Explanation: In a series resonance circuit, series resonance occurs when capacitive reactance is equal to the inductive reactance that is XL = XC. Explanation: As XL = XC in a series resonance circuit, the impedance is purely resistive. 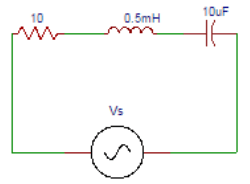 In a series RLC circuit the current lags behind or leads the applied voltage depending on the values of XL and XC. 4. At resonant frequency, the voltage across capacitor is _______ the voltage across inductor. Explanation: At resonant frequency, the voltage across capacitor is equal to the voltage across inductor. 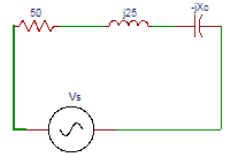 If one of the parameters of the series RLC circuit is varied in such a way that the current in the circuit is in phase with the applied voltage, then the circuit is said to be in resonance. 5. In series RLC circuit, the voltage across capacitor and inductor are ______ with each other. Explanation: In series RLC circuit, the voltage across capacitor and inductor are 180⁰ out of phase with each other. The frequency at which the resonance occurs is called resonant frequency. 6. The voltage across the LC combination in a series RLC circuit is? Explanation: Since the voltage across capacitor and inductor are 180⁰ out of phase with each other, the voltage across the LC combination in a series RLC circuit is 0V. 7. The expression of resonant frequency in a series resonant circuit is? Explanation: The expression of resonant frequency is resonant frequency = 1/(2π√LC). In a series RLC circuit resonance may be produced by varying the frequency, keeping L and C constant. 8. For the circuit shown in figure determine the capacitive reactance at resonance. Explanation: We know at resonance, capacitive reactance is equal to the inductive reactance that is XL = XC. Given inductive reactance XL = 25. On substituting in the equation we get XC = 25Ω. 9. The value of the impedance at resonance in the circuit shown in the question 9 is? Explanation: We know that at resonance the value of impedance at resonance. So Z = R. Given R = 50Ω. On substituting in the equation we get Z = 50Ω. 10. Determine the resonant frequency (kHz) for the circuit shown below. Explanation: The expression of resonant frequency is resonant frequency fr = 1/(2π√LC). Given L = 0.5mH and C = 10uF. On substituting in the equation we get resonant frequency fr = 1/(2π√(10×10-6)×0.5×10-3)) = 2.25kHz.